We are Kyle and Abby Warmington. We recently took the reins of Pak Mail Cascade on APRIL 10, 2017. We can’t wait to meet you and look forward to serving you! 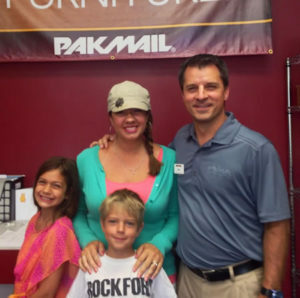 In August of 2014 we purchased Pak Mail Northland Drive and we saw 30% growth in the first year by simply doing one thing well … CUSTOMER SERVICE! We have no desire to reinvent the wheel so we believe customer service is the road map for Pak Mail Cascade too! We hope to gain your trust like we are doing on the north side of Grand Rapids. We want to be your shipping department and are ready to do what it takes to win your business! We have already reorganized the store a bit, put up some new paint and brand new carpet is on the way! We want to make the next 20 years of your experience at Pak Mail Cascade a fantastic one! Everybody matters whether you need a postage stamp or to ship an ART PRIZE sculpture! We are eager to help you get it from here to there safely, efficiently and in the most cost effective method we can find! I tell all my staff – everybody is a child of God and deserves to be treated as such! We look forward to meeting you, hearing your stories and learning how we can best serve you! Please come in, say hello and bring us your shipping challenges and we’ll figure it out with you! We can’t wait! This entry was posted on Tuesday, May 16th, 2017 at 10:55 am and is filed under Crating, Freight, Packing, Promotional, Shipping. You can follow any responses to this entry through the RSS 2.0 feed.